The Cub Scouts section has its members in the age range from 7 to 11. The program is mostly based for the kids to have fun. The section is commonly known as the pack section and the most common type of activities are crafts, hiking, swimming, playing and listening to music, exploring the outdoors, camping, and even cooking on open fires. The Cubs also get introduced to simple scouting skills such as orienteering, first Aid and knotting. Cubs are split in small groups of 6 and are referred to as sixes. The leader of the team is called Sixer. What Is Cub Scouting after all? Everything you do in Cub Scouting has a purpose. Find out what the Cub Scout Promise and the Law of the Pack mean. Learn the Cub Scout Promise and the Law of the Pack. The leaders will help you learn to recite the Cub Scout Promise and the Law of the Pack. Cub Scouting is the first step on the Scouting trail. Learn more about Scouting family of programs, and how you can stay an active member your whole life. Cub Scouting is bigger than your pack. Millions of boys and girls are Cub Scouts across the nation and around the world. Cub Scouts has lots of fun doing a lot of interesting things!. There are games to play, songs, codes, skills to learn, places to see and go and new friends to meet. Cub Scouts all help each other, and try to help other people too. Each week you`ll get together with other boys and girls your age and be led into adventure! During parades you will wear your own Cub Scout uniform to show you`re one of us. And you`ll be able to collect proficiency badges to put on your uniform to show your achievements. Cub Scouts get to see a lot and do a lot. We organize educational visits like museums and historical sites, summer and winter camps, day activities including cycling, tracking signs, nature walks and much more. There`s a lot more Cub Scouts do too. To check some of our latest activities please click here and then why not come along and find out for yourselves? You`ll find there are around 40 boys and girls in your Cub Scout Pack. All of them are just like you. They all might have different interests and be good at different things, but they all want to enjoy themselves and have fun. Like you, they`ll be learning new things each week and discovering how great it is to be a Cub Scout. At your first Pack meeting you may feel a bit shy to begin with but it won`t take long to get to know everyone. 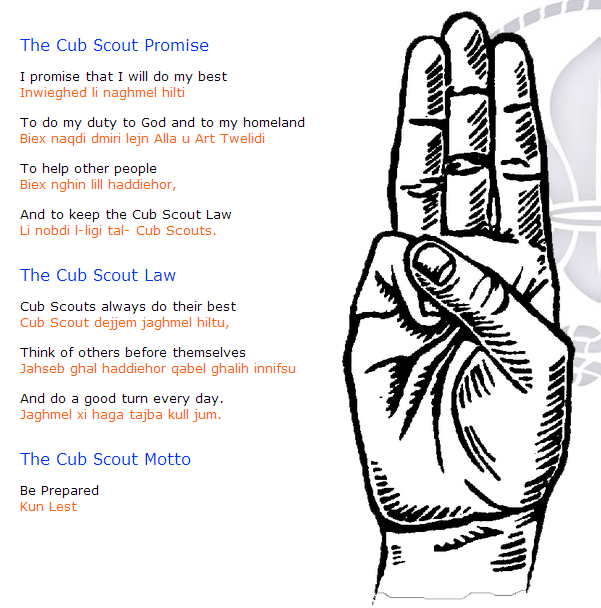 You`ll learn the Scout Salute, the Handshake, the Motto, the Grand Howl, Pack Calls, the Cub Scout Law and Promise. The leaders will help you. You`ll soon be making friends with the other Cub Scouts and having a wonderful time! Your Pack will be divided into `Sixes`, so named because each `Six` will have 6 people in it. You will identify your `Six` from your scarf woggle. One of the boys or girls in your group will be your `Sixer` (a bit like the Captain of a sports team). The Sixer often has a `Second` as a helper (a bit like a Vice-Captain). You too could eventually become a Sixer or a Second of your Pack since cubs rotate between organized activities and regular meetings. Your Leader is known as `Akela` (The Wolf – the one who stands alone). Akela`s helpers are known as `Bagheera` (The Panther – the teacher of hunting) and `Baloo` (The Bear – the teacher of Jungle Law). In our pack, you will also find `Raksha` (Mother Wolf), `Kaa` (The Snake), and `Rama` (The Bull). The names are from the famous Rudyard Kipling story `The Jungle Book`, which you may even watch it on a video or DVD. Cub Scouts can earn proficiency badges by doing things that interest them and by learning new skills like cycling, crafting, sports, cookery, history, nature, services and more. There are also Progressive Badges earned by doing things like tying knots, first aid, hiking, cook out, crafts and building models. There are three levels: Bronze, Silver and Gold Arrow Badges. 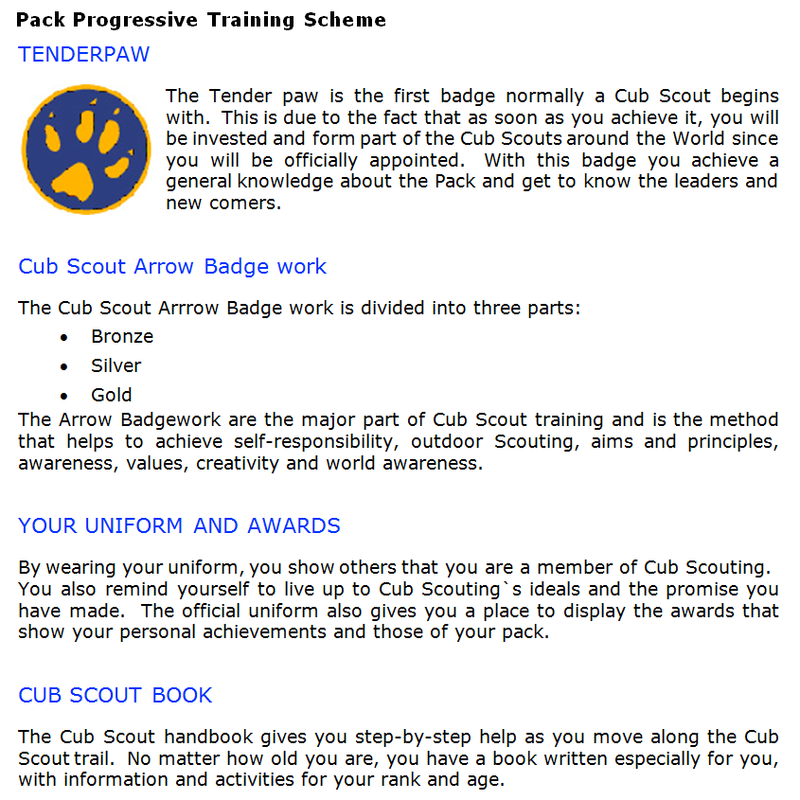 For more information on the cubs scout progression scheme please click here. How do I join the Cub Scouts? First of all Cub Scout Packs meet every Wednesday between 6 and 7.30pm. If you want to take part in the fun of Cub Scouting, either as a Cub Scout, or as an Adult Leader or helper, please download and fill in this form.